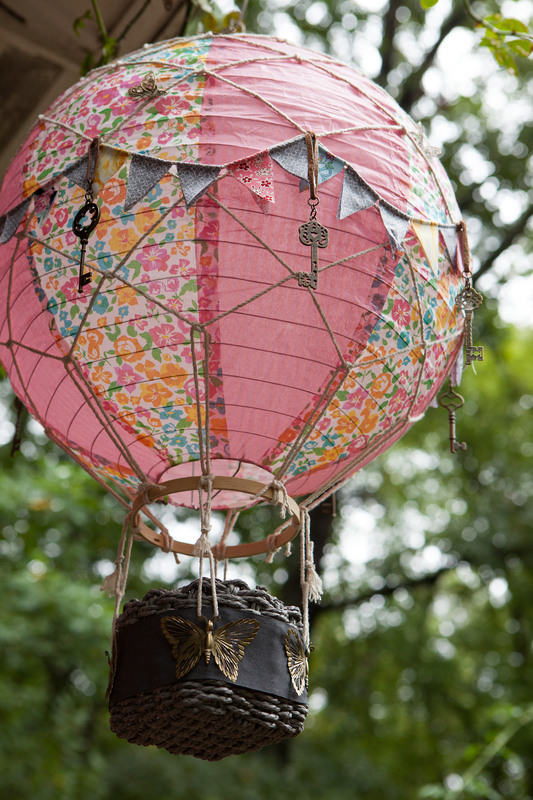 I wanted to make something special for her room so I made a Hot Air Balloon mobile to hang up. 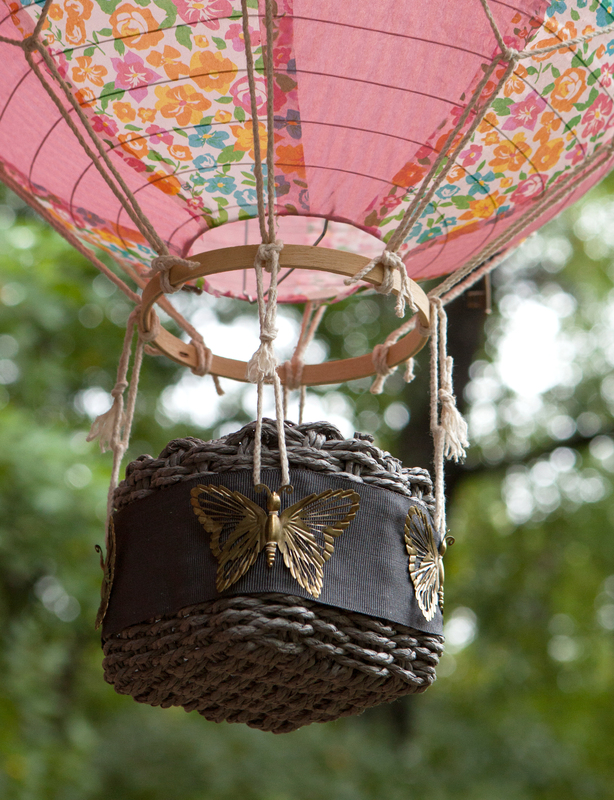 Hot Air Balloon mobile, made from a Japanese paper ball, embroidery hoop, basket and brass charms. 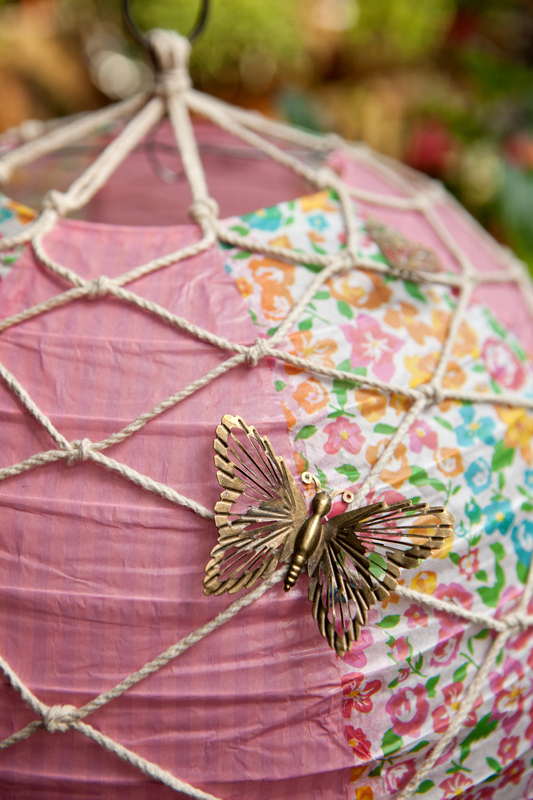 The beautiful paper ball was purchased when two of my sons and I visited Tokyo a couple years ago, so the Japan connection is very special to my son. He also has been on a hot air balloon team so thus the connection to hot air balloons. 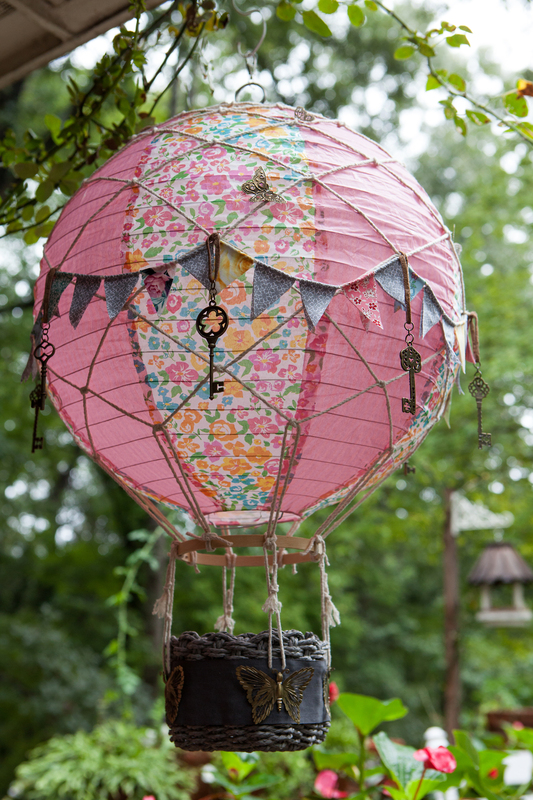 Hot Air Balloon decoration to hang in my granddaughter’s room. 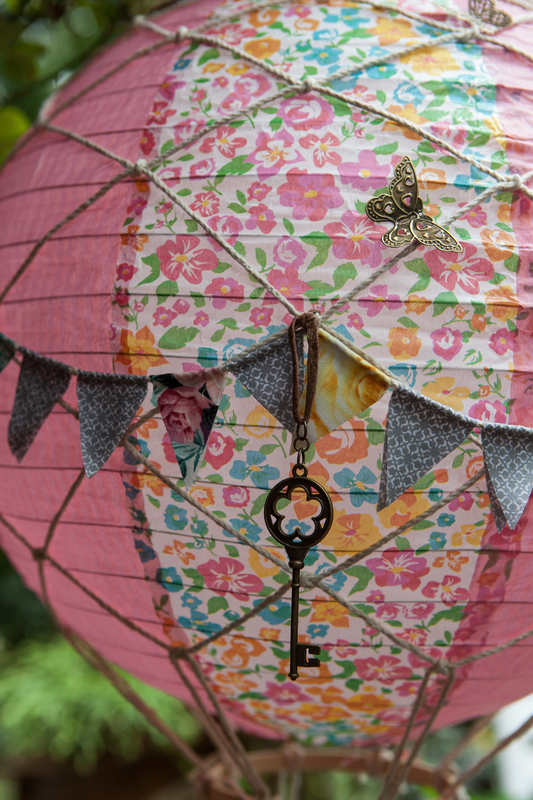 My daughter-in-law loves butterflies so I was really happy to find the metal filligree butterflies and brass keys in my craft supplies. 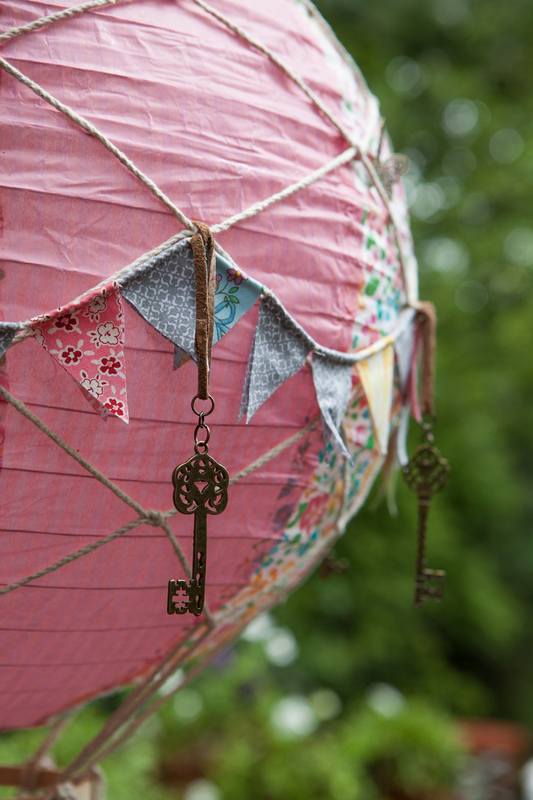 The hardest part of making this was tying all the knots equidistant from the top of the balloon so it hung straight. I hope my granddaughter enjoys it for many years. She’s six now. Last year she carried a ship to the beach. This year she carried a picnic basket. The delicious treats filled the tray. The blooming tea was still warm. Coconut Cream glaze dripped down the blueberry pomegranate jam-filled cakes. Some were topped with toasted coconut and macadamias, others were topped with sugared rose and lilac petals. Vanilla pearls were sprinkled on top of shell-shaped spice Madeleines. Tiny oranges looked like blooming lotus blossoms and green and Concorde grapes filled the bowl. Crumbly Lavender Lemon Shortbread squares and tea cups were piled on the picnic basket top. On the top tray: Vanilla Bean cakes filled with Blueberry Pomegranate Jam and topped with Coconut Cream Glaze, toasted coconut & macadamias, sugared lavender and rose petals. On the bottom tray, Spice Madeleines sprinkled with vanilla pearls. On the dessert plates under the tea cups: Lavender Lemon Shortbread. She poured a cup of tea and waited by the sea. The sunset was soft and dreamy. The breeze was warm and welcome. The colors were slipping away and still she waited. And finally her mom sat down. Even when the sunset is gone, Tea by the Sea is best with mom. [We had a wonderful time making the treats for this, setting up the table and photographing it all. Thank you, Gabriel Monroe, for being second shooter and lighting expert. Thank you, Donna, for your lovely suggestions and help. Thank you, Uncle Butch and Aunt Dilly, for the use of your beautiful chair! We had a splendid time and it was perfect. It was overcast but we still had fun. The kids play with red, white and blue balloons on July 4th. The table was set with an exquisite pedestal chandelier. Delightful piano music wafted through the door. The King, the Prince and the Princess looked over the royal menus. At the Queen’s Restaurant, the table glowed from the light of the beautiful chandelier and candle on the table. “What would you like to order?” asked the Queen. “What would you like to eat?” asked the Queen. “I want a fruit tray,” said the Prince. The King watched as the Queen ducked under the table to pick up a menu. “I will have steak, a sweet potato and peas,” said the King. “I would like Sesame Chicken, please,” said the Princess. There was a commotion over by the door as the guests finished reading the menus. A horse peeks his head through the dining room door! “Oh dear, oh dear!” said the queen as she rushed to the door and tried to get the horse out of the room. The Dragon was a bit distracted but he continued playing piano music to calm the diners. The Dragon tries to keep playing the piano, despite the antics of the Horse. The beautiful decorated cake in the Queen’s Restaurant kitchen was ready for serving. The queen went up to the garden where she picked herbs and fresh oranges from the tree. The kitchen bustled with activity as the meals were made. Many meals were made ready for guests. Soon the King was eating his delicious steak and sweet potato and peas. The Princess thought her sesame chicken was delicious and the Prince enjoyed his fruit, especially the watermelon and strawberries. He also got some extra food because he was still hungry. “Would you like dessert?” the Queen asked. “Yes please!” they all said. “I have to use the restroom,” said the King. The Prince and Princess ate all their food until there were just crumbs on their plates. The Queen set the table with a plate of delicious chocolates, cupcakes and hot chocolate. The King had coffee. Meanwhile, the Horse and Dragon went upstairs to the tea room because they were hungry too. They looked over the menus and gave their orders to the Queen. Downstairs the guests finished their desserts. “Please refresh yourself in the garden,” said the Queen. Soon everyone was in the garden getting fresh air. Everyone had lots of energy because they ate so much dessert and didn’t want to just stand around. The Prince was fascinated with the fountain, especially since it had fish in it. The Prince wanted to catch the fish. The Princess ran to talk to the horse. The Princess fell over but then she got up and started running after the Prince and they decided to play a game of chase in the castle, going up and down the stairs. That upset the Queen because it was her restaurant so she locked herself in the secret room under the stairs so she would be safe while everyone was running around. And there the story ended because the lively game of chase throughout the castle required all hands so no more pictures could be taken. He learned how to play the vuvuzela! It was a memorable New Year, 2014 was. My grandson blasts the vuvuzela for the first time.